Anthony Maracle joined up in Mount Forest, Ontario on this day in 1916. He stated that he was born in Deseronto on January 15th, 1886. He was the son of Moses Maracle and Jane Williams, who were both Mohawks. Maracle joined the 153rd Battalion of the Canadian Expeditionary Force with the regimental number 928669. He was five feet five inches tall with a dark complexion, brown eyes and black hair. His service record shows that he was discharged on May 15th, 1916 as medically unfit for service. 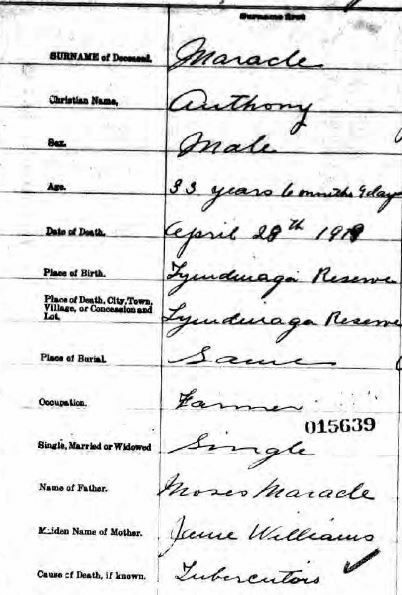 Anthony Maracle died of tuberculosis in Tyendinaga on April 28th, 1919.